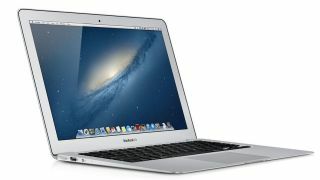 Is this a first look at the Retina MacBook Air's display? The 11-inch MacBook Air launched in 2014 is likely to be the last one. Pictures of what appear to be the the rear casing and new logo of Apple's forthcoming next-generation MacBook Airs have surfaced on two websites, one in China and one in France. The spy shots were published independently by the two outlets and show the rear of the device, the display and a polished Apple logo – similar to that used on iOS devices - that may replace the glowing one currently used. The more interesting ones show the screen, complete with a black bezel, next to the 13.3-inch MacBook Air. It's also compared sideways and top-view to what looks like the iPad Air. The new iteration of the MacBook Air is expected to be the company's thinnest laptop yet and compete with the likes of the Dell XPS 13. The Toshiba Portege Z20t or the Lenovo Yoga 3 Pro. Many expect it to come with a Retina Display with two models available, a 12-inch and a 13-inch one, although one wonders whether it wouldn't make more sense to stick to one size. Unsurprisingly, the new MacBook Air will almost certainly use a Core M processor because of their low power consumption. Check out our review of the 2014 edition of the MacBook Air.